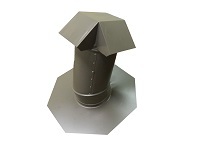 The only roof jack with an adjustable stack and base. Adjusts to fit most roof pitches. Available in 6″ and 8″. Patented design US Pat #8,534,013 B3 and US Pat #8,615,943 B2. 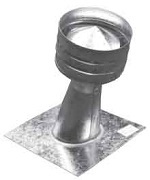 Rain Cap with wind band and roof or deck mounting flange provides weather protection and ease of installation. Internal screen protects against unwanted pests. Available in 4:12 pitch or flat (special order).